READINGTON, NJ — QuickChek is taking its ability to provide fresh products and food-to-go to new heights in 2018. Just as they have redefined “fresh convenience” throughout the metropolitan area, the Whitehouse Station, NJ-based company’s huge 4,425-square-foot air conditioned store at the QuickChek New Jersey Festival of Ballooning could not be any more convenient for Festival-goers looking to enjoy restaurant-quality meal options at value prices. The July 27-28-29, 2018 event at Solberg Airport in Readington, NJ marks the fresh convenience market chain’s 26th year as title sponsor of the New Jersey Festival of Ballooning, the longest running sponsorship of any festival in the United States. 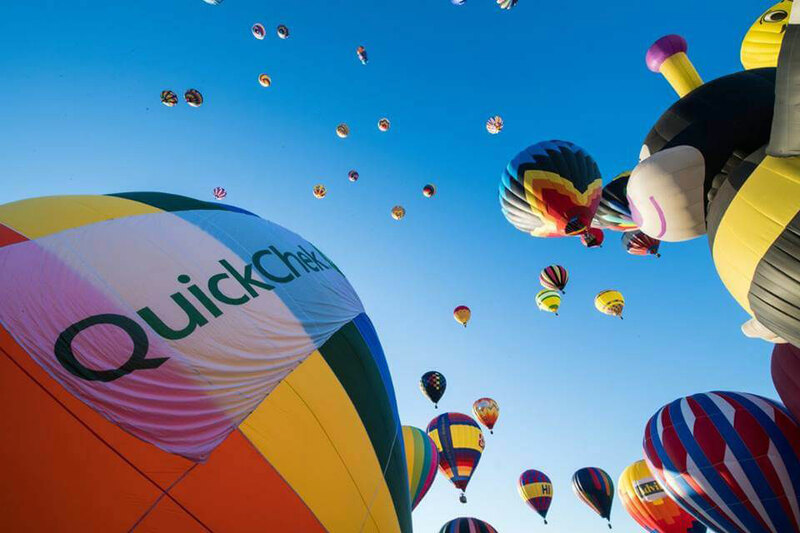 It is the privately-held company’s largest branding event and will once again feature a special shaped QuickChek hot air balloon among the 100 balloons scheduled to fly twice each day. The three-day Festival is the largest summertime hot air balloon and music festival in North America. Featuring morning and evening mass hot air balloon ascensions, headlining concerts, fireworks, a 5K race, and children’s entertainment and amusement rides, it has been named the premiere family entertainment attraction in the state. From locally roasted morning coffee that has been voted the best in America to breakfast sandwiches to delicious custom made-to-order QuickChek subs prepared with the freshest ingredients, attendees will be able to enjoy their food and beverages exactly as they like them, served up with the same high energy and friendly service you find at any of the company’s local stores. QuickChek’s 154 stores serve as the exclusive retail ticket outlet for the Festival and offer great value-added savings on Festival admission in the months leading up to the event. Recent new stores and new stores opening throughout New Jersey and New York in 2018 feature a new layout and design that meet the needs of today’s fast-casual shopper. The sleek open concept features earth tone colors, cleaner sightlines and expansive aisles with spacious food stations including extensive displays of freshly made QuickChek grab-and-go food and market items. Fresh baked goods are made in-store; new stand-alone soup stations offer a daily rotation of freshly-prepared, never-frozen QuickChek soups made with all natural ingredients; and consumers can enjoy an “All Day Lunch” menu of great tasting subs at great prices. Embracing the dining habits of today’s millennial consumer, indoor seating counters offer phone and laptop charging stations and free WiFi. “We feel this new store design provides a better showcase for our high-quality, great tasting fresh food and beverage menu items as we continue to meet the ever-changing shopping and dining habits of today’s consumer,” said Durling, whose family-owned company was named the 2016 National Convenience Store Chain of the Year. Fast friendly service provided by locally hired team members, self-checkout counters and an expanding mobile ordering menu further meet the needs of today’s on-the-go shopper (download at www.quickchek.com). The annual event is regularly featured on news outlets’ and travel publications’ lists of must things to do in the summer. The Festival attracts upwards of 165,000 people and has an economic impact of $43.7 million on New Jersey’s travel and tourism and local economies and brings positive recognition to the state through the worldwide media attention it receives. To learn more about this year’s Festival, including ticket information, sponsorship, crafter and vendor opportunities, please visit www.balloonfestival.com.